"NOT TOO SWEET - 10th ANNIVERSARY DELUXE BOX SET". Hard to find Numbered Limited Edition original factory pressed Deluxe Box Set, containing 4 LPs, one CD, one cassette tape, a 20 page booklet and a poster, released in 2016. This is Number 197 (see photos 3 and 6). The whole box is STILL FACTORY SEALED, with original sticker. The sticker is OUTSIDE the factory seal. As with all these Deluxe Box Sets from SR Records, there is some splitting of the factory seal (see the photos). This is how the item was received from distribution. Picture 8 is the stock photo from the press release showing the contents of the Box Set. 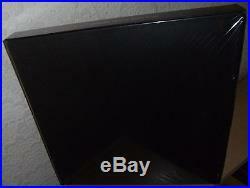 The whole item is now stored upright in bubble wrap for full protection and is priced accordingly. See my other items for more ELVIS. Live at The Hilton Hotel in Las Vegas, Nevada on August 18th, 1972, Midnight Show - Ambient Recording. Until It's Time For You To Go. You Don't Have To Say You Love Me. You Gave Me A Mountain. You've Lost That Loving Feeling. A Big Hunk O' Love. Can't Help Falling Love. Live at The Hilton Hotel in Las Vegas, Nevada on September 1st, 1972, Dinner Show - Ambient Recording. Walk That Lonesome Road J. Sumner & The Stamps Quartet. A Big Hunk Of Love. Live at The Hilton Hotel in Las Vegas, Nevada on September 4th, 1972 DS - S0UNDB0ARD Recording. Previously Released - First Time On Vinyl. (Let Me Be Your) Teddy Bear / Don't Be Cruel. Little Sister / Get Back. Can't Help Falling In Love. My Babe (Bonus Song from the Opening Night, August 4th, 1972). Recorded live at The Hilton Hotel in Las Vegas, Nevada on August 4th, 1972, Opening Night. Side 1 Time 26,00. Mystery Train / Tiger Man. Side 2 Time 24,00. Sammy Davis Jr & Paul Anka Introduction. Ambient Recording Previous Released, IMPROVED SOUND. Total Time 58,51 min. Recorded live at The Hilton Hotel in Las Vegas, Nevada on September 1st, 1972, Midnight Show. Guadalajara (excerpt) / Love Me. Can't Help Falling In Love (from September 4th, 1972). 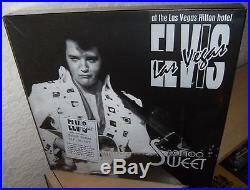 These recordings are for Elvis concert collectors. Do not expect professional quality sound. These are for collectors who want to hear Elvis as he was, recorded on tape by fans at the concerts. For those who understand, enjoy what has been left. Elvis is not making another album. PRESS RELEASE:- (with picture 8, showing the contents). Soon to be released from the SR label is their first special BOXSET, featuring a special deluxe edition of the second label release'Not Too Sweet'. In 2005 this show has been the second release of the SR records, for the label 10 years anniversary the producers decided to reprint THIS SUPER SHOW in a limited deluxe boxset! Five shows of which two unreleased. + 20 Page LP Sized Booklet + Poster (30x60 Cm) + Original 100 Copies Bonus Card. 20 page booklet LP sized, 130 gram glossy paper from the superb artistic layout, where we analysed the August & September 1972 season and in particulate the five shows here included. Including reviews, newspapers clip, imports released and photos. POSTER 30x60 cm 130-gram glossy paper. You can find Three different kinds randomly included in the boxset. CARD included three different kinds repro of the original bonus cd card 12x12 cm. 100 copies only randomly included in the boxset. CD Original'Not Too Sweet' Show September 01, 1972 MS Improved Sound, Digitally Remastered, Ambient Recording. 4LP SET 150 VINYL GRAM- August 18, 1972 DS unreleased show, Ambient Recording -September 01, 1972 DS Unreleased Show, Ambient Recording -September 04, 1972 DS Previously released, digitally remastered, Soundboard Recording. First Time Ever on Vinyl. Opening Night August 4, 1972 complete show, include previous unreleased material Straight copy from the original tape, Ambient recording. 100 of the 500 cassette will be in RED, good hunt. EACH LP has presented with his own art black and white sleeve. About The Season (Extract from the booklet). Without any doubt August 1972 is the focus of this year for ELVIS, 64 strong shows for this season, Elvis's voice was great - even richer than in his January/February season! Elvis also looked superb - just as good as in the recent June tour with such HIGH QUALITY SHOWS, looking great , in excellent spirits. After a modest opening night the show will go growing day by day. Seems strange but Elvis keeps his performance to the top for all the season and even this attitude will be growing to the end of the season with shows longer and with a very serious approach to the music, Elvis cared about his songs and each performance was'fresh' like he was singing' it for the first time, also Elvis being a perfectionist expected a quality performance from everyone during every song! Maybe the present of 200 English fans from the first September give him an extra incentive to deliver some killer shows, maybe only for a while he could to live his dream to be playing in EuropeWithout doubt a different kind of approach to the music the normally we can't find in Vegas Elvis' performance normally also in his earlier season Elvis begins to be tire of Vegas after the second week of the engagement.. In the same time he sings a different kind of songs. Not too sweet, it brings to the best quality to date!!!! The definitive release of the august&september vegas season! Weight of each BOXSET : 1,5 KG. We always tryin' to give more, We hope of this new release will be a real great update of your Elvis' live show collection. FOR THE LAST is easy to understand with the variation present in the boxset will be very hard to get the same copy. A classic for the TRUE collectors. I will not send any other way, so please do not ask. It is not available to PO BOX addresses. The item "ELVIS PRESLEY 4 LP + CD + TAPE DELUXE BOX SET NOT TOO SWEET 2016 SR RECORDS" is in sale since Monday, November 21, 2016. This item is in the category "Music\CDs". The seller is "headingley81" and is located in Royston.